In store at Hornby Hobbies, Swindon Designer Outlet (McArthur Glen) Only. 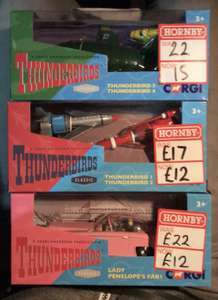 Thunderbird 2, 4 and Fab 1 have all been previously released by corgi in alternate packaging. Thunderbird 1 and 3 are new designs. With the exception of FAB 1, the vehicles are similar to the Matchbox range of the 90’s but with an improved job (TB2 is virtually identical). The box says "age 3+". Surely that should read "age 43+". How many 3 year olds have a clue about Thunderbirds? The box says "age 3+". Surely that should read "age 43+". How many 3 year …The box says "age 3+". Surely that should read "age 43+". How many 3 year olds have a clue about Thunderbirds? Plenty if they can use a Kodi box. Those that may have been watching any of the three new series from 2015 onwards. How many aged 43 are going to try to eat the vehicles? Those that may have been watching any of the three new series from 2015 …Those that may have been watching any of the three new series from 2015 onwards. [ https://www.youtube.com/channel/UCtbLAxtXlWrvx1UrHF3i7PQ ]How many aged 43 are going to try to eat the vehicles? There are three new series? Brilliant! I'm going to give them a watch, just as soon as I finish my morning nibble on Thunderbird 3. There are three new series? Brilliant! I'm going to give them a watch, …There are three new series? Brilliant! I'm going to give them a watch, just as soon as I finish my morning nibble on Thunderbird 3. Mumsy won't let me have Thunderbird 4 after the last incident.